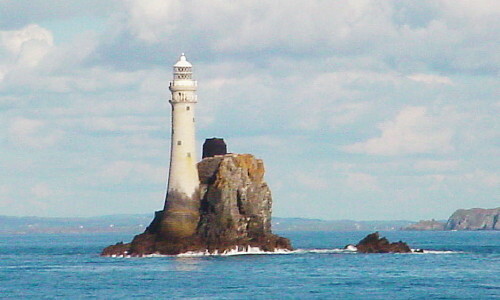 The Irish name for the Fastnet Rock is An Charraig Aonair or ‘the lonely rock’. The word Fastnet probably comes from Old Norse for ‘sharp-tooth isle’. Both descriptions are apt for the isolated outcrop that is the southernmost point of Irish soil. It lies some 19 km (10 nautical miles) from Baltimore and 7 km (4 miles) off Cape Clear. For ships crossing the Atlantic it is often the first, or last, sight of Europe. There is no firm evidence of ships actually striking the rock, but one can imagine that were some near misses in the days before a lighthouse was built. Impetus for building the lighthouse came from the sinking of the Stephen Whitney which struck the head of the West Calf Island in 1847 with the loss of 92 lives after mistaking her position on passage from New York to Liverpool. Prior to that there had been a light on the highest point of Cape Clear island, but it was frequently obscured by low cloud. The first Fastnet lighthouse was made of cast iron and finished in 1854. However, the structure proved unequal to the rigours of the environment and was soon in need of reinforcement. Today the black base of this original lighthouse, converted into a fuel store, is still visible on top of the rock. In 1895 the decision was taken to build a completely new lighthouse and work commenced two years later. During construction the foreman in charge, James Kavanagh, sometimes stayed on site for a year at a time. Sadly, he did not live to see the finished fruit of his labours. The graceful upward curve of the new lighthouse is composed of more than 2,000 interlocking granite blocks quarried in Cornwall. Before their departure from England each course of blocks was assembled in the yard to make sure it was a perfect fit with its neighbours. The blocks, some weighing three tons, were transferred to the Fastnet by a specially built steamer, the Ierne. The light itself was provided by oil burners mounted within twin four-sided lanterns. The whole mechanism, weighing six tons, floated and revolved in a vat of mercury. The first attempt to install the light in October 1903 was thwarted by a sudden storm which swept much of the apparatus into the sea. The new Fastnet lighthouse was eventually commissioned in June 1904. The entire project, one of the most ambitious feats of lighthouse engineering ever attempted, had cost £90,000. The lighthouse was manned by four lighthouse keepers. In 1969 oil lighting was replaced by electricity supplied by diesel generators. The light retained the same characteristics as the original — one flash every five seconds — but it was brighter with a range of 27 nautical miles. At about the same time a helipad was constructed on the rock. Until then keepers had to be transferred by boat, a somewhat hazardous undertaking in such an exposed location. Finally, in 1989 the Fastnet became fully automatic and the last keepers left the rock. With their departure An Charraig Aonair was truly the lonely rock once more.